The name of military and glider pilot Gregorius Radvenis and his contributions to the sport of gliding in Lithuania have been unjustly forgotten, since the word which best describes him and his accomplishments is “first.” He was the first Lithuanian to become professionally proficient in gliding. He was the first to teach this sport to others in Lithuania, the first to head newly-created gliding schools and the first to achieve new local records in this form of flight. As with many aviation initiatives in Lithuania, the sport of gliding is closely connected with the aviation design engineer Antanas Gustaitis. 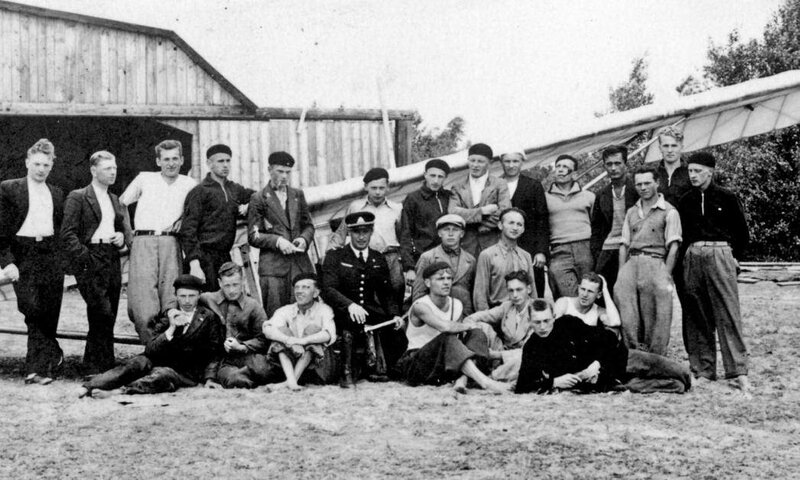 On August 11, 1931, on Gustaitis’ urging, the Aeronautics Club of Lithuania organized a visit to the Rossitten Gliding School, located on the German side of the Curonian Spit peninsula. Impressed with what they saw, the club decided to send a few gifted pilots to the school to practice gliding techniques and then share what they learned on their return. On October 2, 1931, Radvenis left for Rossitten on his own motorcyle. Glider pilot training at the school was divided into three stages. A pilot would receive “A level” qualification (first stage) when he was able to remain aloft for at least 30 seconds. The second “B level” qualification not only required the ability to fly straight but also to maneuver the glider and complete five flights with turns. Upon acquiring more advanced gliding technique and upon being able to remain aloft for no less than five minutes, a pilot would receive “C level” qualification. In a letter to his friend. aviator Viktoras Aš- menskas, Radvenis wrote: “Since I had almost eight years of flying experience, I could have satisfied the requirements for ‘A’ and ‘B’ pilots with my first flight, but that would have gone against all the rules.” A training glider and a rubber cable, which could be stretched to get the glider aloft, were all that were needed for the preliminary requirements. To achieve “C level” qualification and to graduate gliding school, one more feature was required: a favorable east RRG Zögling (“gandras”) glider at Nida, 1933-34. wind. On October 20th , a day with such a wind, Radvenis satisfied all of the requirements for “C level” qualification, flying a glider named Falke (falcon) made by the German firm Rhön-Rossitten Gesellschaft. 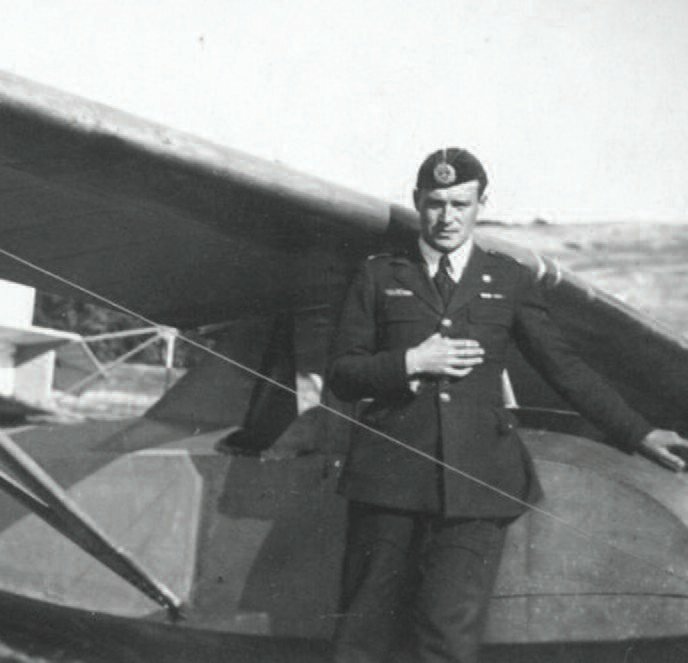 Thus, Radvenis became the first professional Lithuanian glider pilot. Radvenis returned promptly to Lithuania and helped spur the development of gliding in his home country. An aviation club was established at the Kaunas College of Technology (KCT), and, in the winter of 1931-1932, Radvenis organized courses there. Students were taught gliding theory, gliding methods and how to construct these nonmotorized flying machines. Military pilot Lt. Vladas Adomavicius, a member of the Aeronautics Club of Lithuania, also taught there. Once the courses got going, the Aeronautics Club gave the KCT club a set of construction drawings detailing how to build a glider model called the Zögling (the word means “trainee” in German, locally called “gandras”). These drawings had been obtained from the RhönRossitten Gesellschaft (RRG) company. Radvenis was appointed to oversee the construction of this glider. Bronius Oškinis, a member of the KCT Aviation Club, suggested improvements to make the flyer more aerodynamic and to lessen its wind resistance. Since construction was supported using only local funds, it was important to use materials economically. Radvenis took advantage of opportunities available to him and obtained materials needed for construction of the glider from factories operated by the Lithuanian Air Force. These included bolts for the steering wheel and other parts of the glider that needed to be braced, as well as cutters and braided steel-stretching tools. The metal parts were the most expensive items needed for the building of gliders. Once these items had been obtained, construction of the glider moved forward quickly. As summer approached, courses on gliding theory concluded and construction of the glider neared completion. The final assembly was done at a field outside Petrašiunai. Due to local improvements in design, the finished plane took on a form somewhat different from the original RRG Zögling. The adapted and improved glider was given the name Technikas-1 (or T-1 for short). On August 14, 1932, Radvenis flewthe newly constructed glider, taking off from one of the sand dunes in the area. The Petrašiunai Gliding School, the first gliding school in Lithuania, thus began operation the next day – August 15th. Professor Zigmas Žemaitis, the president of the Aeronautics Club of Lithuania, came to the inauguration ceremonies. Canon Juozas Tumas –Vaižgantas blessed the glider, and Radvenis regaled the guests with a demonstration flight. Radvenis became the Head of this school and its only instructor. At first there was only the one glider. However, soon thereafter the Aeronautics Club of Lithuania donated two RRG Zögling gliders which had been constructed in Lithuanian Air Force factories. The Club also gave the school funds to build a small wooden hangar. The gliding pilots used the hangar when they needed to get out of the rain, and sometimes they even stayed there overnight. During the first season of the school’s operation, only three “Alevel” gliding pilots were graduated: Bronius Oškinis and two members of the Aviation Club – Leonas Kinaitis and Antanas Paknys. Granting a higher level certification was not possible at the Petrašiunai Gliding School because the sand dunes found in the area were not sufficiently large. 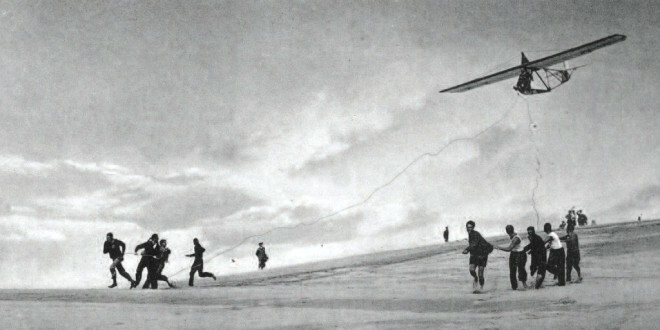 As the first gliding season drew to a close, events known as “gliding days” were organized, which in later years were enormously successful. They popularized the sport of gliding in many of Lithuania’s cities and towns. The first gliding day took place in the market square of the city of Panevežys in October of 1932. A second was held in November in the city of Marijampole, in the exercise field of the 9th infantry regiment of the Lithuanian Army. At both events, Radvenis, with the assistance of members of the KCT Aviation Club, gave gliding demonstrations. These demonstrations were received enthusiastically in towns far from Kaunas. This was the first chance most spectators had to see a glider and watch it in flight. 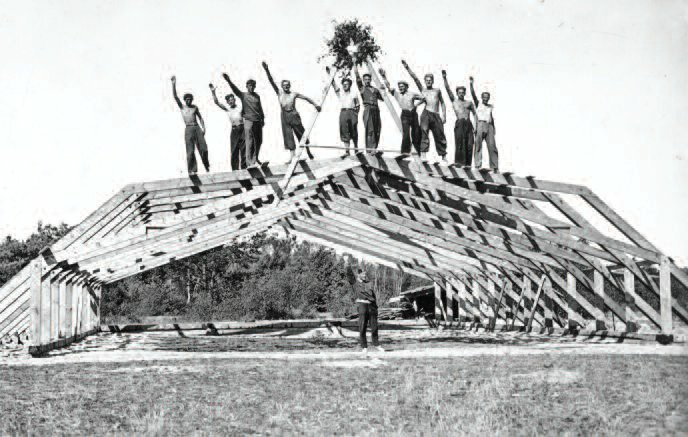 Building a hangar at the Nida Gliding School, 1933. The Aeronautics Club of Lithuania thought that gliding had a potentially favorable future in Lithuania and decided to create a gliding school that could prepare gliding pilots of all three levels of qualification. One area suited for such a school was the sand dunes near the town of Nida. 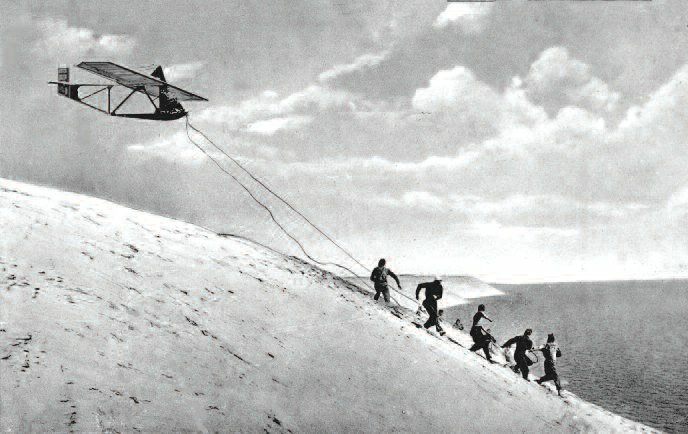 The naturally formed eastern slopes of the dunes were perfect for gliding. On August 2, 1933, members of the Aviation Club of the Kaunas College of Technology loaded a barge with gliders and materials needed to build a hangar for the school and set off on the Nemunas River for Nida. On the same day, Radvenis left for Klaipėda on his motorcycle. In Klaipėda he found a good location for the gliding school and arranged for the necessary transport. On August 9th construction of the aviation hangar began. Viktoras Ašmenskas, a member of the Aviation Club who had to supervise the construction, remembers that construction work alternated with gliding lessons. If it became windy, the men working on the construction of the hangar would go to the sand dunes to fly.The Nida Gliding School was officially opened on August 4, 1933, even though the construction of the hangar had not yet been completed. Radvenis was appointed the first Head of the school and its first instructor. Gliding training proceeded faster and more intensely than it had in Petrašiunai because the natural conditions in Nida were more favorable. Gliders could stay aloft longer thanks to a backwind that developed when the east wind was favorable. While the hangar was still being built, Radvenis achieved the Lithuanian record for time aloft in a glider, staying aloft in Sakalas for 3 hours and 10 minutes. On page 7, he is pictured next to the glider in which he broke this gliding record. Thanks to the instruction which Radvenis provided, the school prepared some of the best gliding pilots and future glider builders in Lithuania. During 1933 a total of 220 flights were made. Flight time totaled about 60 hours. The first graduates were Bronius Oškinis and Leonas Kinaitis, who completed “Clevel” qualification. In addition, that same year, the school prepared seven “B-level” and three “A-level” glider pilots. A major expansion of the Nida Gliding School began in 1934. Construction of a dormitory, designed by architect Vytautas Landsbergis- Žemkalnis, which included a classroom and a cafeteria, began in early spring and was completed on August 1st . The number of students grew rapidly, and so Radvenis appointed his most experienced students – B. Oškinis, V. Paknys, V. Butkevicius and L. Kinaitis – as gliding instructors. As the gliding season progressed, Radvenis surpassed his previous year’s record time for staying aloft, when on June 26, 1934, he kept the glider Sakalas aloft for 5 hours and 14 minutes. Radvenis (center, in uniform) with students at Nida, 1934. Political unrest cut short Radvenis’ promising gliding career. He remained Head of the Nida Gliding School until July of 1934. On July 11th , Major Jonas Pyragius took over leadership of the school, having been demoted and put on reserve after an unsuccessful military coup against President Antanas Smetona. Radvenis returned to his earlier employment at the Zokniai airport near the city of Šiauliai and did not participate in the sport of gliding after that time. 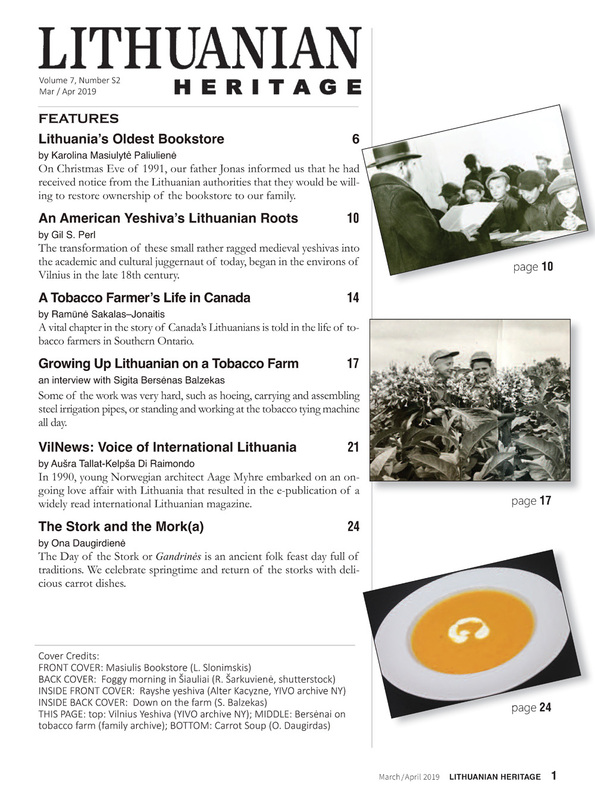 The author wishes to thank Edvardas Radvenis, the son of Gregorius Radvenis, for providing information and illustrations, and Gytis Ramoška, the head of the History and Press section of the Lithuanian Aviation Museum (www.lam.lt). 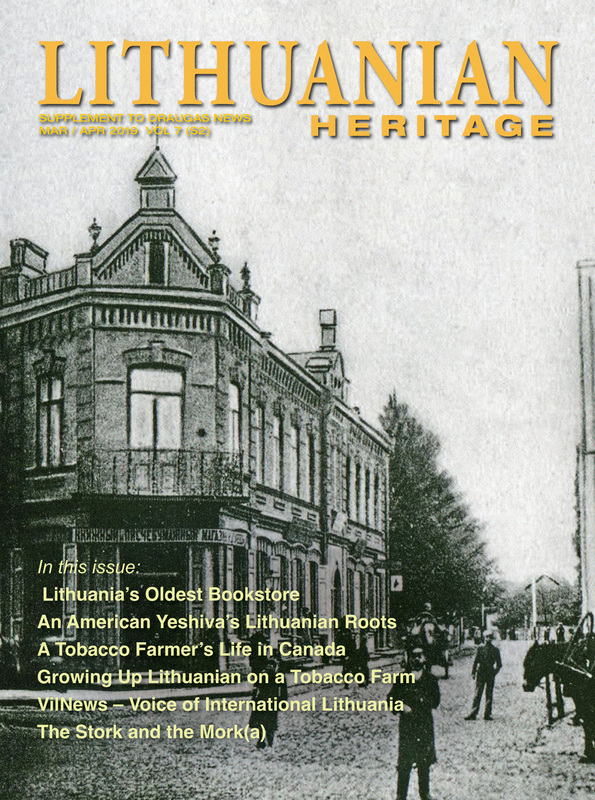 Anyone who has information about the history of Lithuanian aviation is urged to contact the author by e-mail at info@plienosparnai.lt. Translated by Rimas Černius. All photos courtesy of the Lithuanian Aviation Museum.